Christmas season comes with many traditions and much excitement. Your tree is up and decorated, the gifts have been bought, wrapped, and litter the tree base. 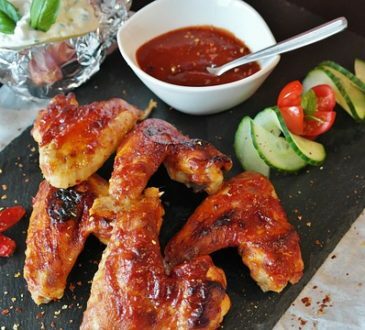 Your menu is ready, and you are wondering how you will serve up your gourmet meal. On your regular dishes? No, no, no! Your Christmas meal needs complementing dinnerware. 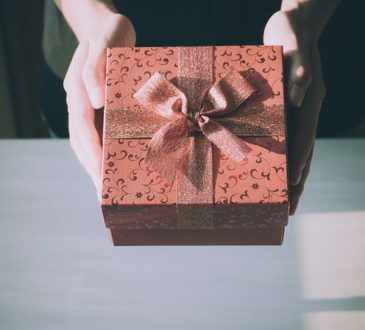 Whether you are looking to have a traditional setting with the holiday’s theme colors, or would prefer to have a chic and classic setting, or perhaps you have some not- so- adult people who will be in attendance- there is always something that will work for you. Below, I share my top 10 dinnerware sets for Christmas, which glam up my table, which will wow your diners. This dinnerware set infuses your holiday gatherings with elegance from its appearance of fine china, and resilience of practicality for family meals. 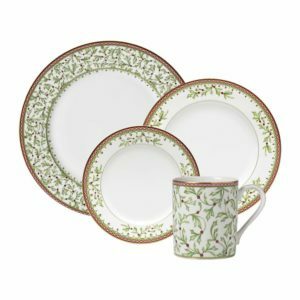 The Spode Christmas Tree dinnerware sets a beautiful holiday scene with its milk-white backdrop, on which ornament- festooned lush evergreen Christmas trees are surrounded by piles of wrapped gifts, and framed by a thick green banding. To complete the season’s look, a scattering of holly leaves and mistletoe sprigs elegantly accentuate the plates and the interior of each mug. Designed with durable porcelain earthenware, the dinnerware set can be used easily and safely in your dishwasher, oven, freezer and microwave. 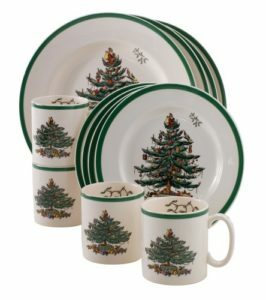 The Spode Christmas tree consists of four three-piece place settings with 10-1/2-inch dinner plates, 8-inch salad plates, and 9-ounce mugs. The mugs have elegant handles that are gently curved to allow for easy sipping, while the dinner and salad plates have a slight recess at the center to prevent spills while filling up on your sumptuous meals. Its Christmas style design makes the Spode Christmas tree dinnerware not only a classic on your table, but a collectible worthy of being beautifully displayed in your open glass cabinet. You can also give this as a special Christmas present to your special friends and loved ones. If you wish to invite the comfort of a classic Christmas style to your dinner table, the Pfaltzgraff Dancing Snowflakes will do just that. And what’s more, the traditional four piece setting has been modernized by adding a large and functional soup (or cereal) bowl. 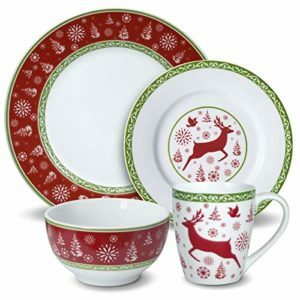 The Dancing Snowflakes dinnerware is embellished with falling snowflakes and wintery evergreen Christmas trees. Each piece has a unique design, from a bold red band with a green garland frame, to white pieces bordered by a green garland, centered by a red leaping deer design. Dancing Snowflakes is sure to become your cherished classic dinnerware for holiday traditions. Crafted from the finest porcelain, this 32 piece dinnerware set that serves eight adds a special touch to your dinner table, and microwave and dishwasher safe. 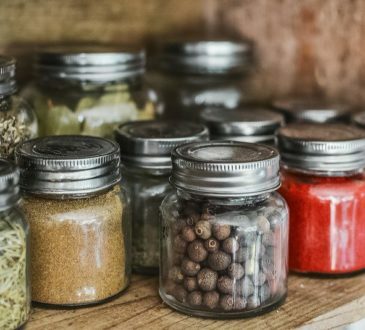 You may also use it in a conventional oven to warm or bake your foods. If your home has little ones that make you averse to adorning your dinner table with delicate dinnerware, the Melange Coupe 32 piece porcelain dinnerware set is your perfect solution. For your daily elegance, this coupe dinner set combines high- quality porcelain with a unique chip- resistance design that has close to 0% porosity, which blocks moisture absorption that guarantees no cracking, flaking or chipping. The Melange Coupe not only epitomizes durability with its premium quality, is beautifully crafted without looking gaudy. It has a simple beautiful pattern of a lush evergreen Christmas tree adorned with colorful ornaments, and surrounded by gift wrapped presents. The lovely pop of color and eye-catching glaze make this an elegant dinner set that is impressive on your dinner table, and as a gift for the season. 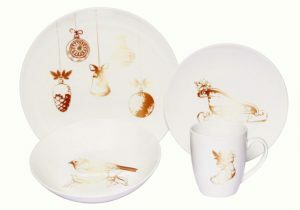 Melange’s porcelain dinnerware set has a coupe design to ensure no food spillage, and is dishwasher and microwave safe. 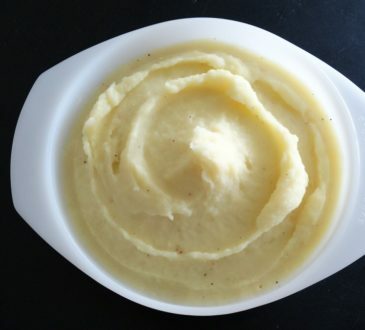 It can even be used in the oven to warm your foods, in temperatures of up to 400F. Melange Coupe Dinnerware is not only fun, exciting and modern in design, it is also tough and durable, and is designed for your everyday use. The casual yet sleek white winter Santa Comes Home Christmas Coupe not only adds a touch of elegant beauty on your dinner table with Santa against a backdrop of Christmas trees and starry sky, but is also perfect for busy homes and commercial establishments. Crafted from vitrified porcelain that is highly durable, they are also ideal for cutting on with knives as they are scratch proof and have non- absorbent surfaces, making them safe. They are also crack and chip resistant. Safe for everyday use in in Microwave, Dishwasher and Oven, up to 400F. For a festive and elegant touch to your holiday celebration, do it with Mikasa Holiday Traditions dinnerware. This elegant porcelain dinnerware set features charming holly and berry borders, trimmed with a well- coordinated red rim. The red, green and white colors truly complement the traditional festivities. 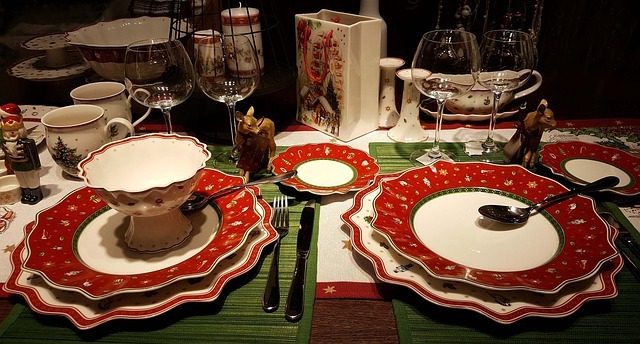 Made from high quality porcelain, you are assured of long lasting dinnerware that you can use both for the Christmas and other traditional festivities. This 16 piece dinnerware set, service for four, includes (4) each: 10-1/2 inch diameter dinner plate, 8 inch diameter salad plate, 7 inch diameter bread and butter plate and 12 ounce mug. 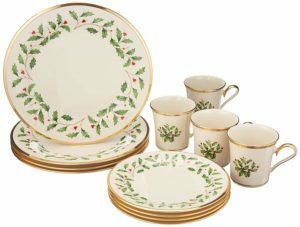 Renowned as America’s most popular holiday pattern, this ivory bone china dinnerware set is exquisitely decorated with a charming and classic holly and berries motif, richly banded with 24- karat gold accents. 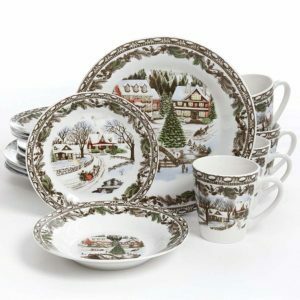 The Lenox Holiday dinnerware set is a traditional classic that is made in the U.S.A, crafted for the rich taste, and because it is made from fine bone china, is chip resistant. It is covered under the Lifetime Breakage Replacement Program of Lenox. It has been designed to easily complement any occasion, from formal dinners to everyday moments, making you entertain effortlessly, for many years. And because of its exquisiteness, it is also a perfect traditional gift. 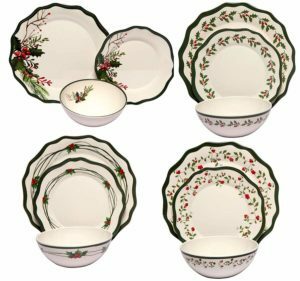 Another great dinnerware set from the Christmas Berry collection of Melange, this one features vintage colors of holly and winter berries in an irresistible holiday look. A uniquely quirky asymmetrical shape gives it added character. Made from 100% melamine that is chip resistant, the dinnerware is scratch proof as well as highly durable. So versatile, safe and easy to clean, the break- resistant design means you can use it on your dinner table indoors, and outdoors for camping, or in your RV. Safe for use in Dishwasher, not for microwave use. If you wish to bring the traditional joy of the festive holiday season to your home with rich, vibrant colors, the Laurie Gates Snappy Snowman dinner set is your go to. The snowman and snowflakes against the vintage red background is a charmer, and every piece of this set is hand painted- quite original. 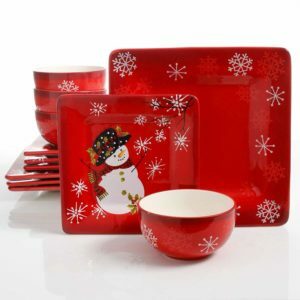 This vibrantly red Christmas themed dinnerware is made from Dura stone, a highly break- resistant ceramic. Not only is it appealing to children- and adults alike, it is also durable. Safe to use in Dishwasher, Microwave and Oven. A beautiful winter setting in vintage colors create a beautifully traditional dinnerware set that is suitable for this festive season. The rustic colors give you an attractiveness that breaks from the old- style red and green theme. The fine detail makes it a work of art. 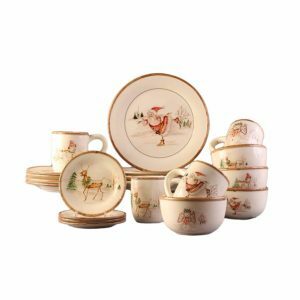 The multicolored 16 piece Gibson home Christmas Toile dinnerware set is made from fine ceramic, making it a durable set that can also be used all year round. It can also be a thoughtful Christmas gift for your loved ones. While adding elegance to your table, this dinnerware set from fashion forward American Atelier dinnerware set also accentuates all your holiday dinner parties. Perfect for nearly any occasion, this 20 piece American Atelier Dinnerware Set will make a stunning partner. The dinner set is made from a completely traditional earthenware in an eye- catching cream color. Earthenware is less dense, making it lighter in weight, but not as chip resistant as other materials. Care is therefore required when using this beautiful set. While less heavy, this set is still microwave safe, but it can get very hot when exposed to high temperatures. 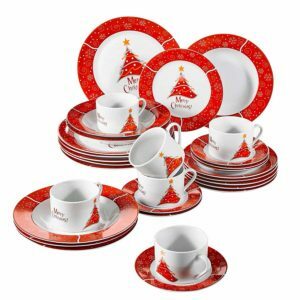 You have a wide array of dinnerware sets for Christmas to select from. Even the price ranges are reflective of the various budgets you may wish to work with, If you will be having many guests, the best option would be to get yourself more than one set, as most sets come with capacities that do not always match the number of your guests. Oh, and don’t forget to have cutlery sets that also complements the entire dining experience. Go on, have a splash of joy and glamour, and deck your dining table with with your choice of dinnerware set for Christmas.